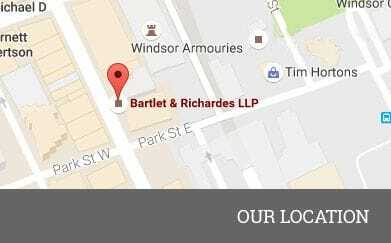 Bartlet & Richardes is a long established law firm providing innovative legal services for Canadian and International clients throughout the province of Ontario since 1887. The firm carries on its practice in virtually all areas of law, with the exception of criminal. Bartlet & Richardes is made up of a team of lawyers each offering their own area of expertise to support the firm and its clients. "Our goal is to perpetuate the integrity of the firm and its longstanding tradition to serve the public." Established in 1887 this firm has gone through many name changes, but has always been anchored by the Bartlet name. A family made Windsor their home in 1854, the same year this community incorporated as a village. And through hard work and dedication, gained prominence within the local community and have left their mark throughout local history. One of the founding fathers was the first president of the Essex Golf & Country Club, a brother was a partner in the department store Bartlet, Macdonald & Gow (a shopping destination for 112 years) , and finally another relative was responsible for the erection of the Bartlet Building in downtown Windsor. There are no longer any Bartlet family members as part of the firm, but the foundation has endured the test of time. It's currently known as Bartlet & Richardes LLP, with the LLP being the only change in the last 40+ years. Over the years, this firm's history offers many notable accolades. From clientele and work that included the incorporation of Ford of Canada, to representing Hiram Walker and working with St. Clair College. In addition to the work they provide, this firm has also produced 4 Superior Court judges, 2 of whom were also appointed to the Bench of the Ontario Court of Appeal. This recognition only reinforces the level of respect for Bartlet & Richardes within the legal community.